Matilda Ekholm (Sweden) and Georgina Pota (Hungary) may come from different countries, but they turned out to be the perfect doubles formula in Olomouc after beating the Russian duo of Maria Dolgikh and Polina Mikhailova in a thrilling final. Dolgikh and Mikhailova of Russia were understandably considered favourites heading into the match, having picked up the Women’s Doubles title at the 2016 Slovenia Open (June) and the runners-up award at last week’s World Tour event in Bulgaria. Ekholm and Pota were no strangers to doubles finals themselves with both players having featured in previous finals with other players. 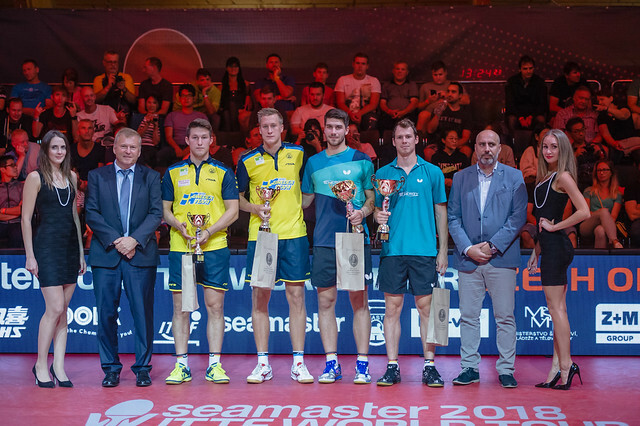 However, the 2016 Czech Open was the first occasion that the partnership Ekholm and Pota had reached a final and they looked in imperious form, registering 3-0 victories across all three of the previous round matches. The final began brightly as both teams attempted to grab the early points on the scoreboard, and it was Dolgikh and Mikhailova who seized the initiative taking the opening end before doubling their lead with a strong performance in game two. Just one more game was required to give the Russians the match, but the opposition of Ekholm and Pota fought back edging the third and fourth games by two points to send the final into a deciding end. Dolgikh and Mikhailova’s confidence levels had been shattered and before long their grip on the trophy had diminished as their rivals from Sweden and Hungary stole the fifth game to bring the event to a close (9-11, 3-11, 11-9, 11-9, 11-7). Disappointment then for Russia at the Open, but a definite improvement from the country’s doubles teams. 2016 is the first year that an all-Russian female duo has won an ITTF World Tour competition when Irina Ermakova and Olga Kulikova took the title at the Lagos Open. Since then three appearances from Maria Dolgikh and Polina Mikhailova in finals, have provided a clear indication that Russia could be around to stay as a strong force in the doubles category.